Last year, I was asked to write a story was about the history of a giant cross that was erected by a group of boy scouts here in Paxinos, Pa in the early 1960's. I was fortunate enough to meet and talk with many of those original boy scouts and to now call them friends. Every year on the Saturday before Easter they host an Easter service up on the mountain where a cross still stands. This year, the service will take place on Saturday, Aprill 11th at 2:30pm. To attend, meet at Clark's Grove Church at 1:30pm to follow the group up to the cross. Martin Reigel, mentioned in the story below, will be the speaker at this year's service. On a crisp Good Friday morning in 1961, a small band of Boy Scouts from Explorer Troop 250 began their ascent up Paxinos Mountain in Irish Valley. They climbed up a small steep path for over a mile carrying nails and raw lumber to erect a symbol of their faith - a 14-foot tall cross that would be visible to motorists traveling through Shamokin on Route 61 and to the surrounding community for miles around. Little did they know that their humble, anonymous display would affect the lives of an entire generation and would still be standing as a local landmark nearly 50 years later. "Of all the goofy things we did as kids, this was just one goofy thing that actually worked out," says Ron Miller, son of the man whose idea it was to put up the cross: Scoutmaster Johnny Miller. Ron, who now lives in Texas, recalls hauling heavy 2-by-12 wood beams up the steepest part of the mountain - a feat he chalks up to youth and sheer tenacity. "We weren't going to be told that we couldn't do it!" adds Miller. Fellow Scout George Nye of Danville recalls they built the cross using materials that had been anonymously donated and generously loaned. In order to make the cross visible at night, the boys employed good old-fashioned thriftiness and ingenuity. "We didn't have generators, so I convinced my dad to let us have two headlights and a car battery. We rigged them up to illuminate the cross. It worked great," Nye says with a laugh, "but I had to climb the mountain every couple of days to replace the battery." "We didn't do it to earn a merit badge," explains former Scout Gary Lewis of Danville. "We were just a bunch of boys out for an adventure." "I don't think any of us envisioned what it would mean to us years later," adds fellow Scout Marty Reigel. As the tight-knit group of teenage boys graduated and moved on with their lives, the cross served as an anchor—inspiring them to become leaders and men of character in their professions. Their legacy also inspired future scouts to continue the tradition of caring for the cross. Harvey Buriak of Danville practically grew up on Paxinos Mountain. For almost as long as he can remember, the cross has been a part of his life. In fact, he built his first house on family-owned land adjacent to the mountain. From his living room, he had a perfect view of the cross. It was only fitting that under scoutmaster Buriak’s direction new generations of scouts began maintaining and making improvements to the cross. In 1986, the troop replaced the original cross with a much larger one. The cross that stands now is 26 feet tall and 12 feet wide and can be seen three miles away. Later, scouts added benches for visitors and reflective material that makes the cross glow in the dark from the flash of a headlight and shine in broad daylight. The effect is stunning. 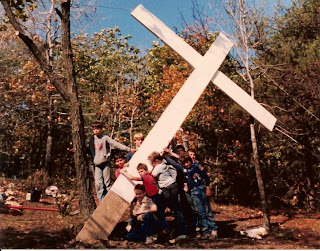 Each year since 1986, the current scouts of Troop 250 have held an Easter service at the cross on the Saturday before Easter. The mountaintop service is open to the public and regularly draws over 100 people. While gathering at the cross, service-goers enjoy a breath-taking ten-mile wide view of the valley. “This [cross] is an Easter tradition, but it means so much more,” said Andrews, referring to the hundred or so Boy Scouts who have worked on the cross through the years. In fact, Boy Scout Troop 250, which is affiliated with the Clark’s Grove United Methodist Church in Irish Valley, has turned out a remarkable number of upstanding men in the community—doctors, businessmen, military servicemen, valedictorians, and Eagle Scouts. By one accounting, 50 percent of the troop’s scouts achieve the Eagle Scout award, which is the highest award in scouting. The national average is two percent. enjoyed your interesting article...saw a fun idea today in the Ensign magazine for this month about making an easter basket filled with church stuff-scriptures, marking pencils, children's hymn book, etc. Check it out.